At the Law Office of Steven D. Barnette, P.C., we provide clients with skilled legal solutions using our years of experience. 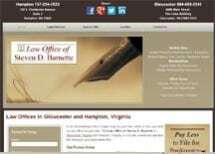 From our office in Hampton, Virginia, we represent individuals in the areas of Chapters 7 and 13 bankruptcy, personal injury, family law and criminal law. We understand how daunting the legal process is, and our attorneys do their best to alleviate your concerns. When you are represented by our legal team, they translate the legal jargon for you so you understand what is occurring in your case. In addition, they fully prepare you for any hearings and for trial, should your case require one. Throughout the legal process, they keep you updated regarding the latest developments in your case and are accessible should you have any questions. Our law firm is dedicated to providing the representation that our clients trust. Whether you have been injured in an accident caused by someone else's negligence or you are getting divorced, we thoroughly investigate the circumstances surrounding your case so we can develop innovative legal strategies. While we look for favorable settlements, we also prepare for trial. For cases that proceed to trial, our clients are reassured by our extensive trial experience. If you are considering filing for personal bankruptcy, our lawyers at the Law Office of Steven D. Barnette, P.C., will fully explain your options regarding Chapters 7 and 13. Our comprehensive services include ensuring that you file the correct paperwork and provide the necessary documentation so you can make a new financial start as quickly as possible.